Those of you who’ve kept up with my recent Venomized reviews know that I think the Marvel shelf has been a bit oversaturated with Venom lately, so you might be wondering why I was so excited to check out the new number one this week. It might have something to do with the fact that I’ve heard nothing but praise for Donny Cates’s recent Thanos run in the Marvel subreddit, as well as God Country. It also might have something to do with Ryan Stegman on Twitter saying that the new book is going to make Watchmen look like the Room, or something along those lines. The point is, I started off hopeful and eventually bought into the hype for better or worse (either I’m an optimist or a schmuck), and they did not disappoint. This is the Venom book you’ve been waiting for. There will be no spoilers here. This book deserves your brain fresh. If I can get my one complaint about Venom #1 out of the way, I would just like to say that there’s been a bit too much back and forth as to whether or not Venom as an entity is stable. That’s it – not even really negative on this issue itself. Under normal circumstances, this might bother me more, but I’m able to look past it because of the substance that this story actually has in just its first issue. I’m not so concerned about the past when I can tell that this book is going to stand on its own and will be talked about for years to come. What sets this book apart from recent attempts at revitalizing the anti-hero’s status is its clear focus, right off the bat. There is a vibe throughout this issue that just reeks of dread and danger. It brings Venom towards the horror genre in many ways in order to differentiate itself strongly from the many same-ish Eddie Brock stories that fall into a safe “crime fighting super hero” box. Fear is practically forming the word and thought bubbles, thanks to dialogue that feels genuine and realistic. It’s rare that I find panic in a comic book to read to naturally and not stilted, because it’s not as easy as just throwing some stuttering in there. It’s more about the thought process. Eddie and the symbiote (who apparently has a name other than Venom, “darling”, or “buddy”) are desperate and presented with a mystery that, to be frank, is intriguing as hell. Such an interesting set up that makes for such believable dialogue is what makes this issue so good. Now, if you’d summarized this issue for me before reading it and then told me that Ryan Stegman would be the artist, I’d have been skeptical. That’s not to dog on Stegman. The dude’s crazy talented in many areas. I just didn’t think he had it in him to bring to life such a dark story like this. But man, did it work. He and inker JP Mayer bring a grit to the stage that I’m happy to say fits the tone of the book perfectly. Looking back at his work on a light-hearted book like, say, Renew Your Vows, it almost feels like a different guy. Venom may look a little reeled back when compared to his depiction by another artist, but a new villain is sure to make your skin crawl (especially if you’re a trypophobe – nnnnnyuhg), and you won’t even know what it’s saying. Of course, colorist Frank Martin has just as much to do with the success in Venom #1. There’s many somber shades throughout the story, contrasted starkly by reds that emphasize danger or violence. They do not play around. While highlighting just how against the odds Venom is against this new villain, they also work efficiently with the motion blur to elevate the action and give a sense of weight and momentum to force. In both complimenting the theme of the story and bringing it to life, the art team goes above and beyond. Go buy Venom #1. I don’t care if you like Venom or not. Doesn’t matter if you’ve read his stories before. Doesn’t matter if you don’t read Marvel or you just don’t read comics. This is a book that knows exactly what it wants to be and isn’t going to hold back. It’s clear that so much time and effort went into this issue, because something as great as this doesn’t happen on accident. 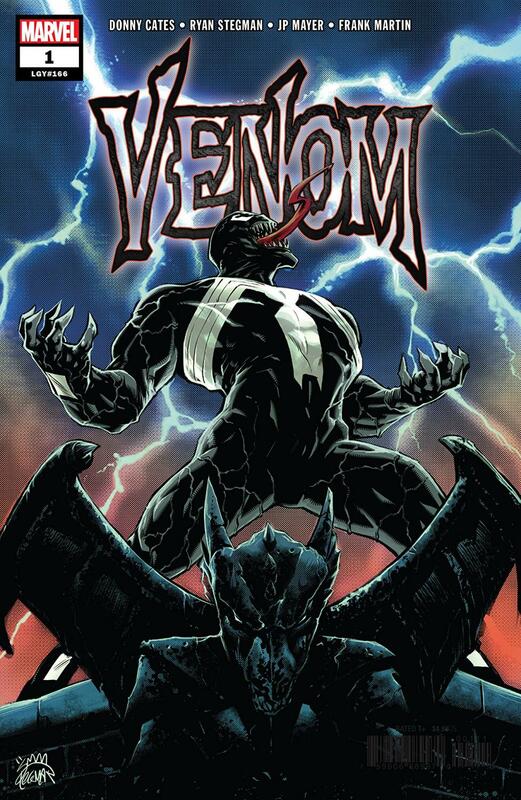 Again, this is the Venom book you have been waiting for. It’s the kind of comic book that you show your friend who’s not big on them to get them hooked. It is one hundred percent deserving of your time and money. Go buy it.